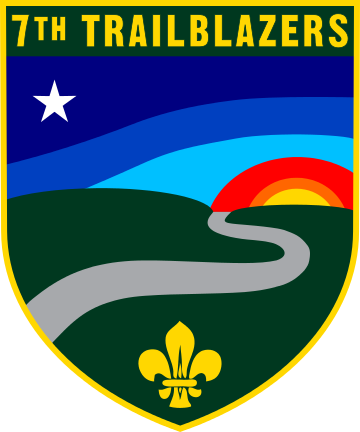 The Pathfinder program is based upon Robert Baden-Powell‘s book, Scouting for Boys, and is similar in appearance to programs that were in common use nearly 100 years ago. When a Pathfinder turns 18, she/he is encouraged to continue their Scouting career by becoming Rover Scouts. NOTE: Pathfinders and above are expected to maintain their own uniform. They will sew on their own patches, launder, and iron them. These are all important life skills and every Scout should know them. Hat: Olive or Brown Campaign style (Brown preferred), flat-brim, four-dent hat with leather band on the crown. OR a green beret is also permitted with appropriate metal pin or patch on front. Shirt: Dark gray short sleeve (BPSA-US lists long sleeve, we have adapted to short-sleeve for the climate) Safari/Bush-style shirt with two front pockets (flap w/ buttons) and optional shoulder epaulets. Pants: Blue, khaki, olive, or gray in color and of a comfortable outdoor/cargo style. Belt: Brown leather or webbing belt. Necker: 36″ square neckerchief of the group’s colors, worn with a ring or slide (“woggle”) at the throat. Socks: Knee length, worn turned down at the knee with green tabbed garter showing on outside with shorts, of approved color: dark blue, khaki, green, or gray. For badge placement, please reference the BPSA Quick Uniform Reference . 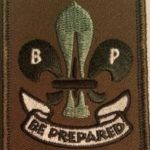 Pathfinder Handbook – BPSA-developed handbook for the Pathfinder section.